You’re ignoring what’s going to happen when they have to completely tear out the split to try and rebuild it to add capacity. Having a P&R right above the split is the only thing that’s going to keep commuters moving. No, it doesn’t. It may eventually stretch up here, but it doesn’t begin here. For instance, right now (7:48 AM), the heavy traffic (per google maps) starts just north of Highland. 1. It’s more than “just a few minutes”. Even today, at the height of rush hour, it may be 20 minutes or more, not even considering how it will be 15 years from now. 2. Exiting the freeway and parking are _invariants_. You either need to do those at highland or downtown (though both may be easier at highland). The compare is walking from P&R to the station (presumably really short) and from the station to your job vs. walking from wherever you get parking downtown to your job. For many people, the former two are shorter than the later. 3. You can’t simultaneously claim that no one is going to use the train _and_ that parking will be a hassle. That’s contradictory. 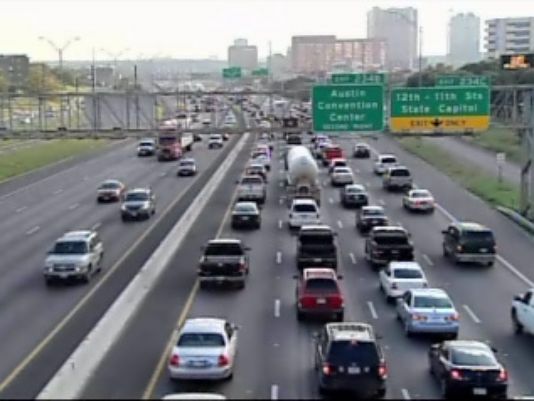 (1) The section of I-35 from Howard Lane to US 183 is included on TxDOT’s list of the 100 most congested Texas roadways, as well as the section from US 183 to SH 71 (south). As the article indicates, a P&R located this close to the final destination (Core Area) would have little attraction to I-35 commuters, and no perceptible impact on I-35 congestion. 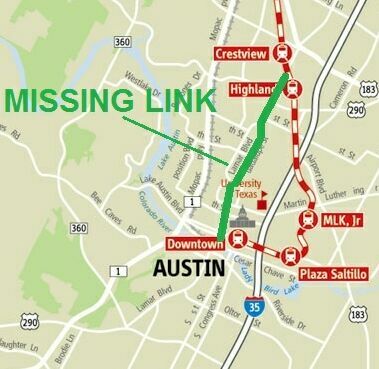 (2) Since Project Connect’s High-Capacity Transit study (fall 2013) never examined a single actual travel corridor, the agency has never released any data comparing peak travel on the proposed urban rail with I-35 from the proximity of the Highland site to the Core Area,.There’s no evidence that an urban rail P&R at Highland ACC would have any significant attraction for I-35 commuters at this point in the heavily congested traffic stream. On the contrary, decades of experience by public transport researchers and planners certainly trump vague rhetorical claims of “congestion relief” from Project Connect spokesmen. (3) Austin Rail Now has made no “claim that no one is going to use the train ….” In fact, a recent article provided an analysis that daily ridership might be approximately 12,000. It’s likely that a P&R at Highland ACC would be used by a segment of local area commuters as well as various off-peak travelers. 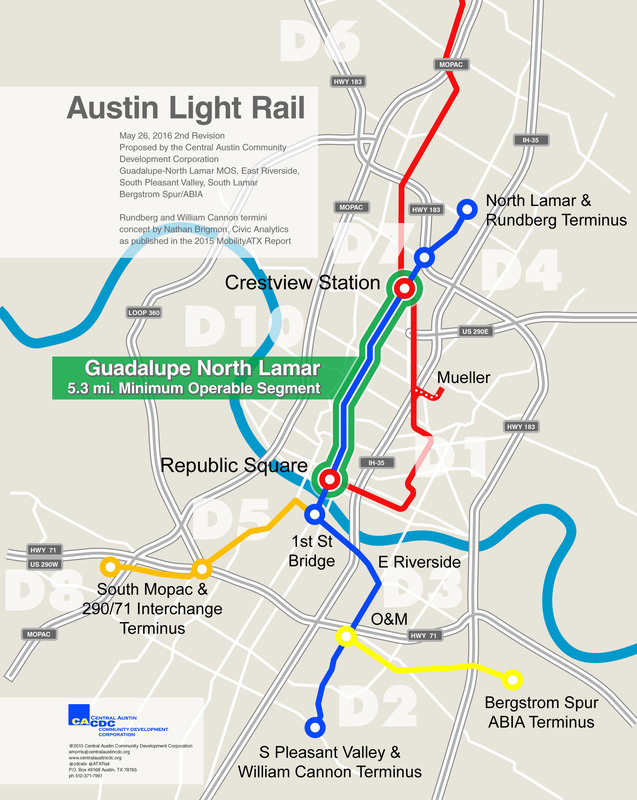 The issue, however, is whether the Highland-Riverside plan is worth such a huge expense, and whether urban rail on Guadalupe-Lamar (with over 3X the projected ridership) at lower capital and O&M cost would be a superior investment that actually addresses and mitigates real mobility problems. Yes, I35 north of 183 gets congested. But look at the temporal patterns. The congestion _starts_ south of there, and eventually backs up further north. Relieving congestion south will reduce that bottleneck, helping to relieve the congestion north. Congestion typically doesn’t form in the suburbs and spread to the core of the central city — it forms close to the final destination and spreads outward. This still does not mean that a P&R so close to the core will attract any significant number of commuters from the freeway (I-35 in this case) and alleviate congestion. That conclusion is corroborated by extensive experience and research within the public transport planning profession. Capital Metro located their major P&R facility at Tech Ridge, near Howard Lane — NOT at the Highland site. That should tell you something. Exactly, so the initial claim that “they already have to travel through severe congestion to access the transit station” just isn’t the case. Many riders don’t have to travel through congestion tor each the station, because there is no congestion on that segment of I35 at that time. Or on 183. Or on 290. That’s another advantage of the currently proposed placement. Putting a park and ride up at tech ridge does nothing for riders coming in along those other highways. They located a park and ride at tech ridge. And others in other locations that also serve 183 and 290 traffic. At least initially, having 3 different P&Rs for those 3 highways isn’t an option. The current urban rail is estimated as $22.1M in _2022_ dollars. 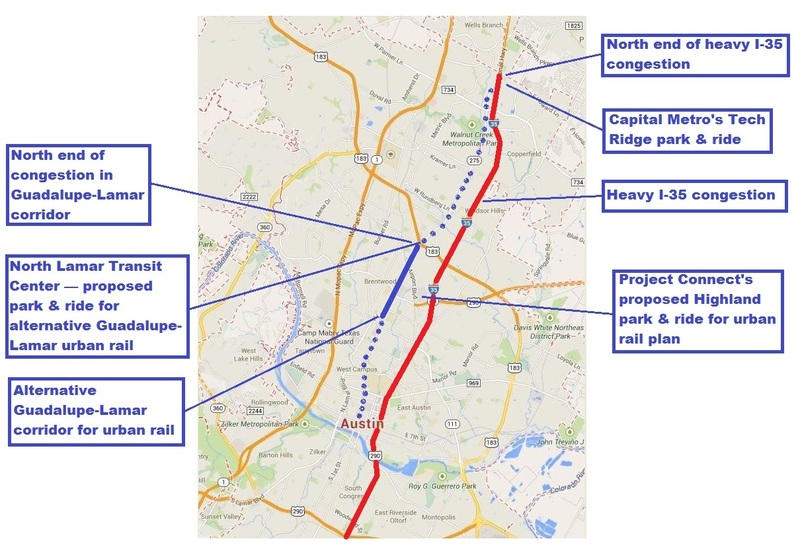 http://impactnews.com/austin-metro/central-austin/austins-urban-rail-plan-could-cost-1.4-billion/ It’s less not even counting inflation. b. Tons of freight traffic get diverted onto our existing roads, adding congestion and pollution and significant costs in road wear. Designed to the same criteria (not removing many lanes, which seems to be a current political constraint), capital costs for the G/L corridor could be _much_ higher. 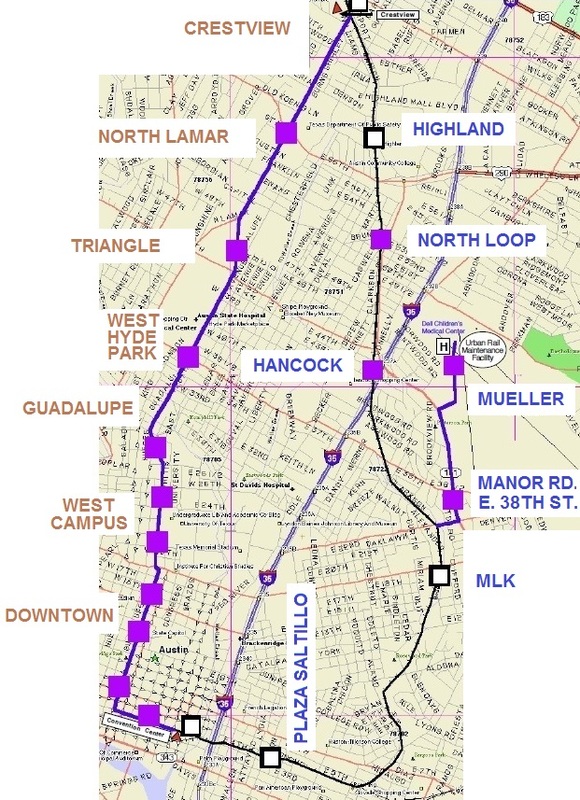 A Guadalupe-Lamar (G-L) line TODAY would have lower O&M cost than Project Connect’s Highland-Riverside (H-R) line. Novacek cites an O&M cost (YOE dollars) from the 2000 plan that extended 14.6 miles to McNeil; today, MetroRail serves the Crestview-McNeil segment and would feed ridership into a shorter G-L urban rail line. Furthermore, G-L urban rail today would have roughly 3X the ridership of Project Connect’s proposed H-R line; this would mean significantly lower unit O&M costs, both per rider-trip and per passenger-mile. Novacek acknowledges that the capital cost of G-L urban rail would be lower, but objects to reallocating traffic lanes to public transport — a retreat from the trend of sound transport planning advocated today worldwide, which recommends giving priority to transit over motor vehicle traffic. Most cities with light rail transit (LRT) or advanced bus transit have made such reallocations with impressive success. New LRT lines in San Diego, Portland, LA, Baltimore, Denver, Dallas, Salt Lake City, Houston, and elsewhere have all implemented this measure to increase total traffic flow and person-movement capacity, plus improve mobility. Installation of urban rail on G-L would not necessarily require the level of total traffic lane reduction that Novacek and various Project Connect spokesmen have been claiming. There are opportunities for right-of-way enlargement (especially near intersections), and other techniques (e.g., splitting the tracks in constrained bottlenecks, designing short stretches of single or interlaced track, etc.) are available and can be explored. Instead, unlike the situation in 1999-2003, Project Connect planners seem to have devoted themselves to a “can’t-do” attitude. The notion that urban rail cannot intersect the MetroRail line (which carries both freight and passengers, and is totally controlled by Capital Metro) is an absurd fiction invented and promulgated by Project Connect. Where’s your evidence for this? What are the numbers, if they differ from the 2000 plan? How can you use the O&M costs from a shorter line, but the ridership projections of the longer line? Or do you have a ridership projection of just a line to Crestview that is somehow bigger than the _entire_ 20 mile 2000 line. But that _was_ the 2000 plan, was it not? What does that have to do with what we’ve been discussing? Austin Rail Now is misdirecting their attention by concentrating on the intersection Of I-35 and Howard Lane 8 miles from the proposed rail. Why not look instead at the Highland site itself? US 290 merges with I-35 at the southwest corner of the site. That is a HUGE TRAFFIC BOTTLENECK. People merging onto 35 or exiting onto 290 back up lanes and contribute a great deal to the congestion on I-35. A Highland rail station would allow these folks to skip I-35 entirely and instead go directly to the rail stop. 290 East goes to Harris Branch, Manor and Elgin, all of which contribute significant populations of workers to Austin. Novacek’s latest questions seem to be recycling questions already covered in this article, or in previous discussion, or in other articles posted on Austin Rail Now. The answers would be readily evident to anyone who sincerely, intelligently, and honestly reviews this material. Also, in the future, we hope to provide an FAQ section that will summarize these kinds of questions, with responses. So additional questions are welcome, and may be useful for that project. I’m honestly asking. I looked for articles on this site of a ridership projection for a only-to-crestview rail line. Or a O&M estimate for a only-to-crestview rail line. I used the site search feature for “3X” and nothing came up. Where is this covered? And how is my question about the complete non sequitur about crossing the red line a “recycling”? Novacek, your previous comment about “ripping out” freight rail service seemed consistent with Project Connect’s nonsensical claim that urban rail and the MetroRail line could not cross (ergo, urban rail supposedly would require the MetroRail railway to be dismantled, or a grade separation constructed). This would not be required for a crossing, just installation of an interlocking. The 2000 LRT plan assumed that freight service would be continued on this railway along with LRT, with temporal separation (per FRA precedence), and this is a valid option for urban rail today. The Light Rail Now plan proposes (in addition to a G-L line) conversion of MetroRail service to urban rail east of Crestview, and eventual conversion westward to Lakeline further in the future. With temporal separation, shared operation with continued freight service would be possible. Our ridership estimates are based on the 2000 forecast (34,700) with adjustments for northwest passenger traffic being fed to the G-L urban rail via MetroRail plus the ridership traffic of an extension to the North Lamar Transit Center and to Seaholm. These estimates probably have about the same level of accuracy as Project Connect’s estimates for the H-R line. I’m making no claims/statement about a simple crossing, I was referring to the running in the corridor of the 2000 plan. I really have to question this, based on the precedent of the Red Line. Even _with_ temporal separation, the FRA wouldn’t allow the already fairly heavy DMUs. CapMetro had to modify them for crash-worthiness. CMTA’s Red Line project was a special case, involving the lack of adequate regulatory oversight and leading to intervention of the Federal Railroad Administration to help bring the project to fruition and permit operation. Modification of MetroRail rolling stock has proceeded on the basis of fulfilling compliance with FRA Title 49 CFR regulations, which will eliminate the need for temporal separation (but this invokes other issues for future rail transit use). In cooperation with the Federal Transit Administration, FRA has allowed temporally separated operation of LRT systems with freight operations in San Diego (Trolley) and Salt Lake City (TRAX), and similar shared operation of DMU-based light railways with freight in New Jersey (Camden-Trenton RiverLine) and Oceanside-Escondido, California (Sprinter). Where are the articles that lay out this ridership estimate and the corresponding O&M costs for this proposed alignment? I searched for “Seaholm” on this site, but didn’t seem to find them. Alternative proposals for urban rail on Guadalupe-Lamar at this stage are mainly conceptual. If Project Connect’s misguided plans can be defeated, a reformed planning agency would hopefully have the resources to conduct, with impartial and genuine interest, the kinds of studies we’ve been calling for and which you seem to be suggesting. If still at the conceptual stage, I’d disagree that such proposals “have about the same level of accuracy as Project Connect’s estimates for the H-R line.”, given that those are modeled. But leaving that aside at the moment, I’m curious about your estimate for “adjustments for northwest passenger traffic being fed to the G-L urban rail via MetroRail”. What do you currently estimate that as being (if only roughly)? Novacek, your questions about intricate details of passenger volumes are more appropriate for the “reformed planning agency” mentioned above that we would hope to result from this process. I’m not asking for intricate details, I’m asking for your order-of-magnitude estimate. Earlier in the thread you were emphatically stating that your proposed route provided “3X the ridership”. How can you make that claim without having at least a general estimate? It’s plausible to speculate conservatively that an initial urban rail line in the G-L corridor, linking a P&R at US 183, downtown, and Seaholm, could attract daily ridership in the range of 40,000-45,000 in 2030. The “east branch” line proposed by TAPT, converting MetroRail from Crestview to the Convention Center to urban rail, with an extension to link with the G-L line, plus a branch into the Mueller site, could add at least an additional 10,000 per day. Those estimates seem substantially inflated. Let’s start with the 2000 plan estimate as a base line. I’ll even be generous and assume that it hasn’t been totally invalidated by subsequent demographic changes and max density decreases (McMansion and the like). Your proposal would then only be the bottom half of that track (approximately). Ridership in that estimate was definitely weighted towards the lower half, of course, but that’s got to have some effect. Does 30K seem fair? To that we add some number of transfers from the red line, numbers from the Lamar P&R, and from seaholm. Obviously each will add some, but 50% more? As a comparison, the ridership estimate from the Highland route seems to ~1600 total daily boardings at Hancock. This combines red line transfers, park and ride, and local boardings. Also, the claim above was for this 3X ridership with _lower_ O&M, while you’re talking about a significantly longer line (7 miles up G/L + 6 miles loop through east Austin + spur to Mueller). How are you going to have lower O&M with 50% more track to maintain and electrify, 50% more vehicles to maintain (to keep the same frequency), 50% more drivers to pay, etc. Novacek, you’ve already just conceded G-L urban rail ridership of 30K. That’s about 2.5 times the ridership (12K) likely for Project Connect’s H-R line. So 30K ridership for a 7-mile line vs. 12K ridership for a 9.5-mile line suggests that not only total O&M would be lower, but also O&M per rider-trip would be less; and, it seems likely, O&M per passenger-mile. But our earlier estimate of 40-45K daily ridership is plausible, so the advantage for G-L urban rail is likely to be even greater. The case for a legitimate publicly funded study of ridership, costs, and benefits in the G-L corridor is substantial. Meanwhile, you’ve taken a lot of your time and energy to dissect and criticize our rough estimates of the potential of urban rail in the G-L corridor, all evidently intended to defend and justify Project Connect’s H-R urban rail plan. So where are the methodology and detailed calculations for ridership, O&M cost, and other performance features for this project you’re defending? Project Connect has presented slick PowerPoint summations, but no crucial details. Since you’re asking this of us, seems like it’s your responsibility to produce them for the Project Connect proposal. We look forward to having this material. Not in the slightest. I explicitly said that was an over-generous value. But I was using it to show that even _if_ you take that value, there’s no way you get to ridership of 54K (3X 18K). I’ll examine this more in another response, so this doesn’t get too long. You really seem confused about what you’re advocating/comparing to. You compare the proposed Highland route to just G/L to crestview for O&M purposes, to G/L plus a “loop” for ridership numbers, to the 2000 plan for capital expenses. Which is it? What is the plan with 3X the ridership (54K) and lower O&M and capital expenses? Why would I have them? If you want more data, ask Project Connect. Now, what they have provided (including what you have linked on this site) is _much_ more explicit and detailed than what you provide. Or what was provided for the 2000 plan, which you seem to use as a touchstone. Readers are encouraged to review the previous exchanges of comments and decide for themselves whether there is any substance or merit to Novacek’s contentions. Let’s get the addition of Seaholm out of the way. Now, Seaholm will be good, but it’s basically just another downtown station. Let’s (for the moment) assume that all 45K is at the downtown stations and campus stations (nothing above that). Again, I’m not “conceding” this, in fact I’m explicitly saying it’s not the case, and will actually be less than this, but let’s take this as an upper bound for now. The 2000 plan had 8 stations in the CBD and UT, so let’s add Seaholm as a ninth and assume that it contributes an equal share, so 45/9 = 5K. So the line to crestview only is 40K. The fact that this is immediately _more_ than the 14 mile 2000 plan should start setting off alarm bells, but we’ll ignore that for now. So how feasible is 40K from downtown to crestview? Well, we already have _a_ transit system from crestview to downtown, the 801 and 1. Or if you don’t like the metrorapid, immediately before the switchover we had the 1L, 1M, and 101. Those numbers are/were in the region of 17K. Now, that’s not the number, because there’s the entire half of the route below the river, and everthing above crestview, but let’s be (again) generous and say 10K. Rail transit attracts new riders, either through the increased reliability or the amenities of the mode. However, it does this on a foundation of the existing transit riders/transit dependent riders. How feasible is a _4X_ multiplier? By comparison, the estimates for the highland route (when compared to existing transit along those routes) seem to be in the range of 2X. Let’s look at this 45K number another way, that just occurred to me while examining other systems. 45K riders on a line from 183/Crestview down to downtown, and a slight jog left to seaholm. Let’s call it 7 miles. Behind only MBTA in Boston. Cities _much_ bigger than Austin. Cities _much_ denser than Austin (I think the whole of SF is denser than West Campus). That includes cities that have lines that tie into much more comprehensive systems (more than just our Metrorail). It includes cities with much longer systems, but also cities with similarly length systems (lest you try to claim everyone else’s ridership is diluted by extra length). The claim just doesn’t pass the smell test. I love Austin, but it’s just not _that_ special, to have better ridership than _everyone_ else, while being so much smaller and less dense. (1) The federally accepted forecast from 2000 for ridership in 2025 was 37,400; this was for a 14.6-mile line from McNeil to downtown. The segment from McNeil to Crestview is currently served by MetroRail, and it’s likely that this service would feed ridership from the northwest to G-L urban rail, in addition to ridership directly generated in the arterial corridor itself. Our rough estimates allow for an additional five years of increase 2025-2030. (2) By Project Connect’s data, population in the “Lamar” sector (which stretches as far west as Shoal Creek, but excludes the West Campus area) is projected to increase by over 50% by 2030; whether this will happen is debatable, but one could plausibly assume a significant increase in population (and density) within the half-mile transit watershed along the G-L corridor itself. (3) Several focal points in the G-L corridor appear ripe for redevelopment, and this would be expected to generate substantial additional ridership by 2030. (4) Some reduction in motor vehicle lane capacity in the G-L arterials is likely with the installation of urban rail; on the basis of proven experience, this would likely encourage a significant shift of travel from motor vehicle traffic to a new urban rail service (other travel would either remain in the same corridor or shift to other routes). (5) Access to G-L urban rail via P&R at the North Lamar Transit Center is expected to attract significant new ridership from neighborhoods directly north (mostly excluded from the 2000 forecast), while also attracting additional freeway commuters bound for the Core Area. (6) An urban rail extension from the G-L corridor to the Seaholm/Amtrak station area would be expected to generate thousands of additional daily trips in 2030. We continue to recognize G-L as Austin’s pre-eminently strongest corridor for urban rail, with the plausible possibility of ridership in the range of 40,000-45,000 by 2030. As noted, we intend to post more details in the near future. What was the model used for the federal forecasts, what were its assumptions, and how many of those (if any) have been invalidated since then? For instance, that forecast predates both the McMansion ordinance and the West Campus university overlay, both of which would work to reduce potential trips. Agreed, however the magnitude of the feeding may be hard to estimate. As previously mentioned, the highland corridor estimate seems to be using a fairly low number for this. Possibly to account for the still-limited capacity of the metrorail as well as the transfer penalty. Compared to the 2000 estimate, it’s really “fewer” years rather than additional. 2025 then was 18 years after opening, while this would be 8 (actually even fewer given the delay of a revote). 2) Agreed. However, by that same data the population (and the population increase) would be significantly _less_ than the ERC which you are proposing to not serve. 3) Agreed, but the same caveat as above. 4) Technically agree, but this is also the biggest risk/danger of this proposal. That removing lanes would either continue to be a political non-starter, or that it would lose _again_ at the polls to an increasingly suburban electorate. 5)I disagree on “significant”. The NLTC is 200 spaces, and I haven’t heard that it’s in any danger of overcrowding. Even an order of magnitude increase in demand (which seems unlikely) wouldn’t add all that many riders. 6) Agreed, though of course such an extension can be done for any proposed route. If ridership numbers were the _only_ concern, the city could just go and ban cars from riverside. Or cut it down to just 1×1. That would bump up their estimate quite a bit, I’m guessing. The narrow width of Guadalupe is a design constraint. Removing lanes may be a tradeoff worth making in some cases, but I don’t think that it’s a particular virtue/bonus. The ROUGH ridership estimate we gave was based on approximately 7.6 miles of route and fell in the ROUGH range of 40K-45K, or about 5200-5900 rider-trips per route mile, using that metric. This was for year 2030, and for the single new STARTER line. Novacek compares year 2013 (2014?) AVERAGE ridership levels of mostly mature SYSTEMS with extensions, some of which have significantly lower segment ridership volumes than others. Even using 2013 and 2014 daily ridership data from APTA, our 2030 projections compare plausibly with the results from some other systems. Before its latest extension, Houston’s original 7.5-mile system (single line) carried ridership of 38,300, or about 5100 per route-mile. Some segments of systems have much heavier travel density than others. Austin is widely recognized (e.g. by FTA, Project Connect, many veteran planners) as having tremendous rail ridership potential. We continue to believe our rough estimates are plausible. Okay, let’s take the low number of 40K, for 5200 route/mile. Now it’s third, behind MBTA and MUNI. Exactly my point. These systems being mature should _increase_ their ridership. Having extension _increases_ the per-mile potential, due to network effect and increased utility. The extensions would only decrease the per-mile ridership if they’re running out in the middle of the boonies, which is assuredly not the case for MUNI. >>Even using 2013 and 2014 daily ridership data from APTA, our 2030 projections compare plausibly with the results from some other systems. But it’s not plausible That’s the whole point. How can we, after just a few years (if that) in 2030 significantly out-perform almost everyone else, while being as small and low-density as we are. If you look at our peer cities, they see ridership on the order of 2k /mile. Which is in line with the project connect proposal. Which is in line with the original 2000 Austin proposal (30k something with ~15 mile). But you’re claiming you’ll outperform that by 2.5-3X. >>Houston’s original 7.5-mile system (single line) carried ridership of 38,300, or about 5100 per route-mile. Exactly. You’re claiming we’ll outperform Houston, in the same point in the timeline (again, if that), while being tremendously smaller and significantly less dense. First, the comparison is primarily made to starter lines (vs. extended networks) in other new LRT systems. These systems HAVE increased their ridership, but several have seen a drop in the ridership/route-mile metric between original starter line and extended system. Examples: Dallas DART dropped 2100 to 1156; Denver 3113 to 1849; St. Louis 2647 to 1152; Sacramento 1257 to 1202; San Jose 950 to 813; Houston 5120 to 3328. The objective in designing most starter lines is to produce a winning line with high ridership while minimizing cost, and this often means locating the starter line in the most lucrative corridor available. Extensions then may reach into less productive corridors in terms of travel density and ridership, or may be more costly, or both. This assessment appears corroborated by the experience of the cases cited above. Austin is not so “small”; it’s now the 11th-largest city in the USA. However, suburban sprawl does bring down the city’s average density, as it does with Houston. Surprisingly, the potential for unusually high ridership appears strong here as it has been in Houston; as we previously noted, Houston’s ridership as well as our own ridership estimate results in a “ridership-per-route-mile” metric much higher than in virtually all other recent new LRT systems. Neither total population nor average citywide density is a particularly good metric for assessing (or criticizing) potential ridership in any given corridor. Better criteria are the specific demographics of a given corridor and travel density. As we previously explained, in producing a rough estimate of potential ridership, we took into account the previous 2025 projection from the 1999-2000 LRT planning process. While this included roughly 8 miles from Crestview to a proposed terminus at McNeil, we believe most ridership would be concentrated in the inner-city central corridor following North Lamar and Guadalupe. 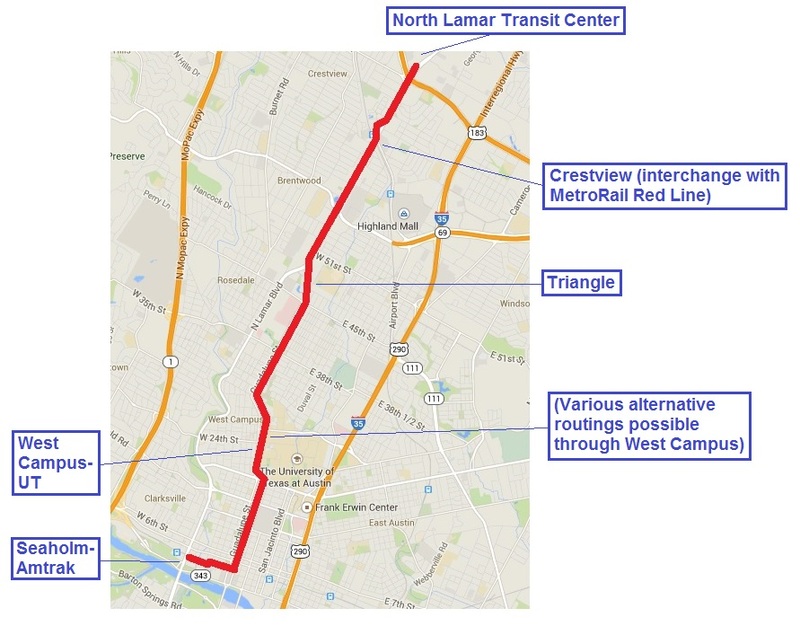 Today much of the passenger flow northwest of Crestview along the same railway alignment would be channeled into urban rail on Lamar and Guadalupe via the current MetroRail service. To this, we’ve added the other factors we previously indicated to produce our own rough assessment of ridership potential. Novacek seems to enjoy maintaining a “war of the speculations”, but we would welcome a bona fide and independent evaluation of urban rail ridership potential for the Guadalupe-Lamar corridor that would end speculation and render reliable projections. Meanwhile, we believe the evidence presented above does suggest that the plausibility of our rough estimate so far is supported by factual evidence. >>Austin is not so “small”; it’s now the 11th-largest city in the USA. Oh come on. You know as well as I do that the municipal border of Austin is meaningless for the ridership analysis. If the Austin city limit was at 2222, and everything north of that was a different city (let’s call it South Round Rock), would Austin’s traffic or transit potential be any different? No. The number that matters is the _metro_ size. And we’re 35th. >>Neither total population nor average citywide density is a particularly good metric for assessing (or criticizing) potential ridership in any given corridor. Better criteria are the specific demographics of a given corridor and travel density. But it’s sufficient for gross estimates. You know that the city that’s 4 times the size, and twice as dense is going to have more riders. The city that’s 1/4 the size and half as dense isn’t going to have twice as many riders. >>As we previously explained, in producing a rough estimate of potential ridership, we took into account the previous 2025 projection from the 1999-2000 LRT planning process. And yet predict massively _larger_ ridership. DESPITE: many of the neighborhoods along Lamar having _lost_ population in the last census. DESPITE: mcmansion limiting the possible density and population increases. DESPITE: the reduction in ridership(to some extent) moving from a single-seat ride to a required transfer from the red line. DESPITE: the introduction of the west campus UNO which acts to _reduce_ transit ridership. Novacek seems to want to continue his “battle of the speculations” by manipulating criteria and falsifying and misrepresenting data and information. We doubt he’s fooling anyone other than, maybe, himself. Okay, which data am I “falsifying and misrepresenting”? 2. FACT Houston is (overall) 27% denser. But it’s not just sprawl. Houston is also significantly bigger in the central city/downtown. 3. FACT Houston has 40% more jobs within 3 miles of downtown, and _2.6 times_ as many jobs (over 600 thousand) in the 3 to 10 mile radius (you know, the approximate distance reachable by light rail). 4. FACT Houston has a much larger population in the central city/downtown area, especially in the 5 to 10 mile radius. And yet you predict you’ll have _more_ ridership than them (both overall and per mile) in less time. (you can repeat this for basically any of the other lines I compared it against). 5. FACT The neighborhoods along Lamar _lost_ population since the 2000 ridership prediction. 6. FACT McMansion was passed in 2006, after the 2000 ridership prediction. 7. FACT Transfer Penalty is a real thing in transit. The exact magnitude is still debated, but it undeniably reduces potential ridership to some extent. 8. FACT The UNO was passed in 2004, after the 2000 ridership prediction.